If you’re like me, then you always have a five gallon bucket in your garage or shed. You may not even know where you got it from or how old it is. You don’t know what was even in it in the first place. It might have been oil or paint, but the label has long since worn off. Those five gallon buckets are useful for all kinds of jobs like something to put pulled-out weeds in, and such. Some innovator has figured out another use with the BucketVac. The BucketVac is a very simple concept whose name says it all: a shop-vac attachment that easily fits on the top of any 5-gallon bucket. Just snap it into place, and you have something to clean up any wet or dry spills. Best of all, the BucketVac doesn’t block the handle that makes 5-gallon buckets so handy. Considering how tight 5-gallon bucket lids area, this BucketVac will probably stay on with a vacuum seal. Seriously, I once tried to pry the lid of a five gallon paint bucket off with my bare hands, and it practically cut into the skin. A warning to anyone that hasn’t done this: use a tool. The BucketVac isn’t expected to hit the market until the fourth quarter of 2009, but it could easily put the ShopVacs out of business. 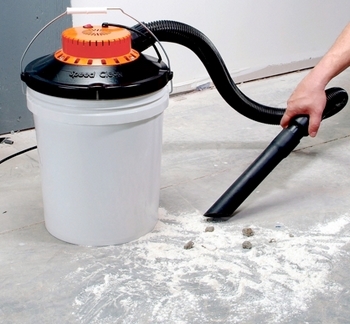 Buy a shopvac and the “bucket” is included. Yet another mfg trying to re-invent the wheel.